Remember the ERA? 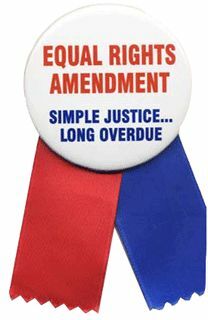 The Equal Rights Amendment was a 1970s piece of legislation that proponents said would help to guarantee equality for American women, especially in the workplace. By 1979, this controversial, much-debated amendment needed only three more states to vote yes for ratification. In one chapter of Murder in Narrow Creek, set in 1979, Dee Ann, mostly out of curiosity, attends a meeting conducted by representatives from the Raleigh chapter of NOW (the National Organization for Women). The NOW ladies have come to Narrow Creek to drum up support for the passage of the ERA in North Carolina, one of 15 states that had not yet approved the amendment. Only Dee Ann and three other women are in attendance as the meeting begins. This soon changes as Mrs. Tippy Gaylord—wife of the president of Narrow Creek Community Bank, Joe’s place of employment—crashes the meeting. Here’s a snippet. Suddenly a voice came from the back row of seats, “Who wants to be equal to men? Most women enjoy being put on a pedestal. I know I do.” I [Dee Ann] turned in my seat to see who had slipped into the room to interrupt the speaker before she had hardly begun and found myself locking eyes with none other than Tippy Gaylord. “I would appreciate the chance to speak before fielding comments from the audience,” Betty [the NOW representative] replied, unruffled. “Personally, I’m not going to sit through whatever communist propaganda you intend to spout off. I came only to warn these impressionable young women here tonight not to believe anything they hear from you liberal feminists.” Tippy Gaylord made the word feminists sound like a profanity while glaring at us “impressionable young women” in the room. I felt her disapproving stare lingering on me. I was hoping she didn’t recognize me from her Fourth of July party. Maybe all the wives of the men who worked for her husband looked alike to the wealthy Mrs. Gaylord. Incidentally, North Carolina never voted yes on the ERA, and the amendment fell three states short of ratification by an extended 1982 deadline. In my next blog, I’ll let you in on how this meeting concerning the ERA advanced the novel’s cozy mystery plot. Those early days of the ERA, back in ’70-’74, were exciting days for me, as a young woman at Meredith College, where women already knew they could be “large and in charge” and were encouraged to do so. I had forgotten how excited we all were at the prospect and possibility that women would actually have a chance be treated equally as men, in the workplace etc. No one I knew wanted to be a man, just they wanted fairness and the chance to pursue their dreams on a level playing field. I think it literally scared the pants off of the men that were in charge, so they voted against it. Thanks for bringing back some fun memories for me. I am looking forward to your novel. Barbara, thanks for your comments. Like my character Dee Ann, I once went to a NOW meeting where the focus was a discussion of the ERA. This must have been about 1974 or ’75. I still have a green campaign button with 59¢ on it that was handed out that night at the meeting. The idea was women earned 59¢ for every dollar a man made. I think that button is a collector’s item now; I keep it in my jewelry box.